One of the better units to look at for tall people. Comes with its own carry/storage case. Three-way flushing is a great feature that keeps your unit cleaner. No rotating spout on the waste tank. Brand is not as well known. 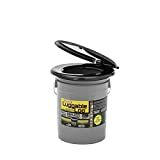 The Leopard is a solid portable toilet at a good price with all the key features of a portable toilet but the added benefit of three-way flushing. 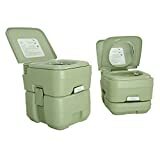 With good height and the different flushing system, we would place this portable toilet above others in the budget range. Has a unique three-way flush system meaning that the water covers most of the bowl when flushing. 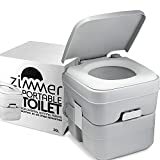 Made of matte polyethylene making it an extremely sturdy and robust portable toilet. A large 3-gallon freshwater tank. Smooth design without corners makes it easy to keep clean. 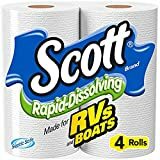 Comes with a heavy-duty storage bag to keep it clean and dust-free when not in use. Integrated, molded handles on each tank make it easy to carry. Both the waste and freshwater tanks have large enough apertures allowing for easy refilling and emptying. Tank capacity: Waste tank – 5.3 gallons and fresh water tank 2 gallons. 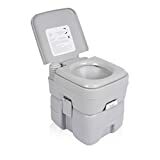 A solid portable toilet at a good price with all the key features of a portable toilet but the added benefit of three-way flushing. 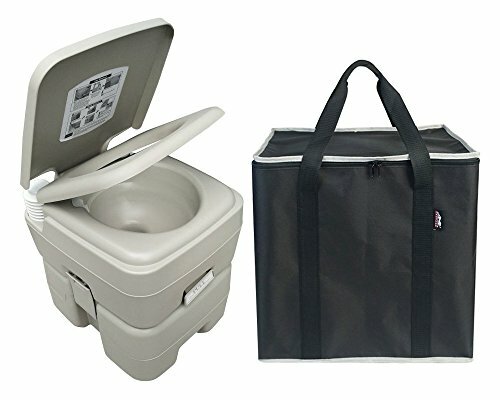 At 16″ high (to the seat), this portable toilet is one of the tallest ones on the market. Due to the matte finish, any scratches are usually hard to see. 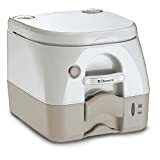 It is a compact unit and easy to clean. The three-way flushing assists with keeping the bowl extra clean. The toilet seat opening is a little small at 8.3″. The toilet seat cannot be locked down.